Ultrasound has always stayed as the safest way of handling skin conditions. This new ultrasonic technology reduces inflammation and aging, so it has revolutionized acne and fine line treatment. Once you try it, you will fall in love with the geek who invented it! He deserves to be a millionaire. The classic facial treatment has helped clear the pores and refine the skin of millions of women and men around the world. 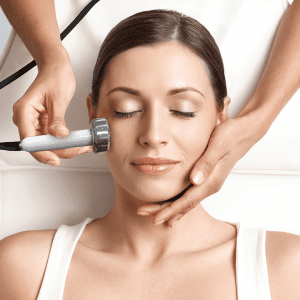 If you’re ready to take your monthly facial to the next level, consider the ultrasonic facial. Using a machine that emits high-frequency sonic waves, ultrasonic facial procedure cleanses, repairs and stimulates the skin tissue. The ultrasonic facial is a medically proven treatment that uses ultrasound waves to loosen and remove dead skin cells and restore the natural vibrancy. The process is safe: it doesn`t use crystals or chemicals and it is perfect for sensitive, sun-damaged, acne and acne prone skin types. A face and neck Ultrasonic treatment takes around 60 to 90 minutes. During the procedure, the operator applies a gentle gel on your skin and gently rubs a soft probe on your skin. You will feel a gentle pressure but no pain, sting, vibration, noise or heat. It is extremely gentle and pleasant. Ultrasound treatment can be used on most parts of the body, including the face, neck, arms, breasts, stomach, waist, hips, buttocks, and legs. What are the benefits of Ultrasonic Facial? The high-tech facial uses a specialized ultrasonic machine that emits high-frequency waves. Ultrasonic treatments benefit a variety of skin types and can improve many common skin conditions. Your esthetician will customize your ultrasonic facial according to your skin type and skincare needs. Exfoliate dead skin cells for clear and radiant skin without the redness and irritation that can sometimes result from Microdermabrasion or chemical peels. Loosen and remove oil, dirt and sebum from the pores and hair follicles, resulting in less blackheads and breakouts. You will be left with a clear, healthy skin with noticeably tighter pores. Gently stimulates skin to encourage collagen and elastin production. With a series of treatments, fine lines and wrinkles are less noticeable and skin color, tone and texture will improve. Stimulates blood circulation and lymphatic drainage through the mechanical effect of ultrasonic waves. This nourishes the skin and gives it a youthful brightness. Increases hydration and plumps the skin, thereby reducing fine lines and wrinkles. Helps skincare products penetrate deeper into the skin. This is especially true for anti-aging and antioxidant serums, creams and masks. Are Ultrasonic Facials Considered Safe? Ultrasonic facial is safe and the sonic waves emitted by the ultrasonic machine aren’t harmful to your health. The ultrasonic facial is gentle, non-invasive suitable for most skin types, from acne to sun-damaged skin. Because the ultrasonic mechanism is so effective at cleaning clogged pores, painful extractions are unnecessary. Your skin will have that lit-from-within glow – making it the perfect treatment to indulge in before a big event. Once your skin is rejuvenated and healthy looking, you can maintain your results with monthly ultrasonic facials.